THE chairman of the Down Community Health Committee , Mr Eamonn McGrady, has called for the community to support the new campaign to restore the full 24-hour A&E cover for the Downe Hospital. Last Friday evening the changes introduced by the South Eastern HSC Trust were introduced and from 10pm on Friday evening the A&E at the Downe Hospital will be closed until 8am on Monday morning at weekends. Councillors Terry Andrews, Liam Johnston, and Colin McGrath with Down Community Health Committee chairman Eamonn McGrady, second right, outside the Downe Accident and Emergency Department at 10pm last Friday evening when it first closed for weekends until further notice. Mr McGrady said on referring to the launch of the Down Community Health Committee’s Facebbook page: “Each and every ‘Like’ makes a difference. 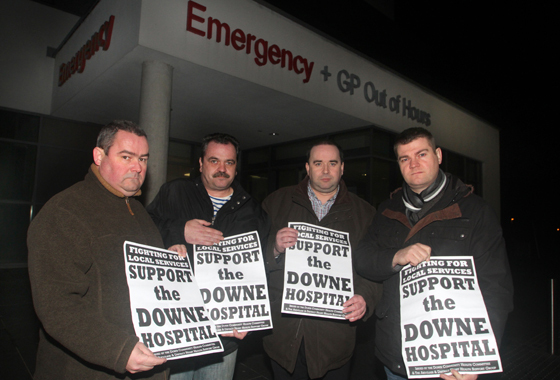 “We must retain the 24-hour accident and emergency service at the Downe Hospital. 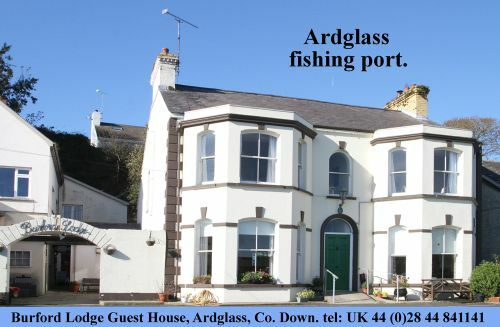 “The Downe Hospital 24-hour A and E Facebook page was created by the Down Community Health Committee as one element of the campaign to fight the Christmas-time decision by the South Eastern HSC Trust to reduce provision in Down District, a decision taken, apparently, without any prior consultation with the local community and it’s elected representatives. “The view of this community is being unambiguously conveyed,” said the DCHC Chairperson who added: “MLA’s are the key people now as healthcare is a devolved matter. “The continued support of our local MLA’s who are undoubtedly highly influential in Stormont, will, I confidently believe, lead to a successful outcome for this campaign. “In my view, the decision to curtail local services still further, even temporarily, was a very wrong one and will have to be reversed. “I call on the South Eastern HSC Trust, which is responsible for the Downe Hospital, to issue a weekly update of the measures being taken and their success, in seeking to recruit the middle grade doctors required to restore the full provision on a permanent basis at the people’s Hospital,” added Mr McGrady.